Did you know that almost 7 in 10 middle and high school students are exposed to e-cigarette ads. 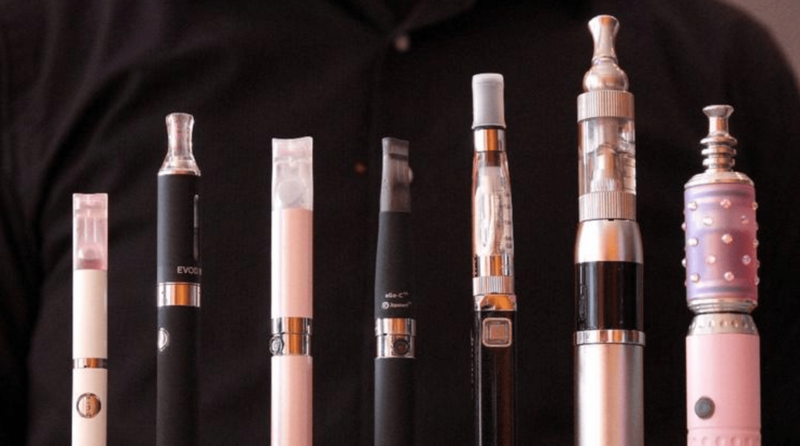 E-cigarettes are now the most popular tobacco product among children. 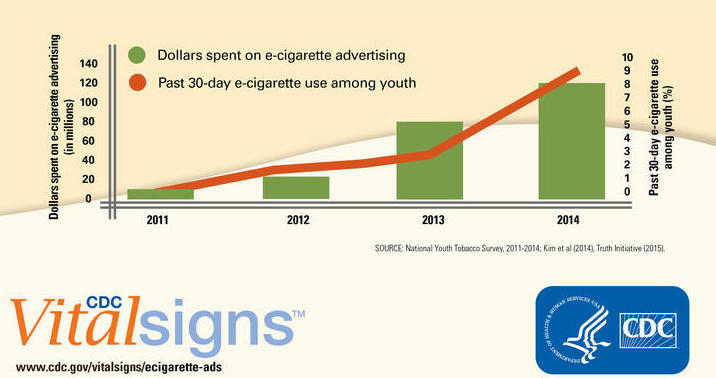 E-cigarette advertising dollars have risen from $6.4 million in 2011 to $115 million in 2014. In high school the use of e-cigarettes in the previous 30 days have gone from 1.5% to 13.4% during that timeframe. A 2015 study in the American Journal of Preventive Medicine found that teens who saw a e-cigarettes ad on TV were 43% more likely to say they would try e-cigarettes than were teens who did not see the ads. In a survey of 41,551 high school students in 377 schools around the country, 8th and 10th graders were twice as likely to have used e-cigarettes in the past 30 days then regular cigarettes. Not only do these e-cigarettes come in fun flavors like cotton candy and apple pie, it’s popularity may have been spurred by popular perception among teens that e-cigarettes do not harm their health. For example among 8th graders, only 15% viewed e-cigarettes to be harmful for them versus 62% believed regular cigarettes had harmful effects. E-cigarette advertising is still not regulated. This has to change. Everyone should be mindful that that e-cigarettes are very prevalent both in high school and in middle school. E-cigarettes do not leave the smell of “smoke” thus it would be easy for parents to be unaware of it’s use by their children. It is also important that parents educate their children on how harmful nicotine is to their brain development. An amazing post! I agree that advertisement plays a huge role in our society so it should be restricted to appropriate audiences indeed. It’s great that awareness among parents is being raised about discussing the safe usage of e-cigarettes. However, it is important to mention that not all e-liquids contain nicotine or tobacco. There are nicotine-free ones as well. It would be great if you post another related article on whether nicotine-free e-cigarettes are safe or not. Interesting piece. I guess there are benefits and downsides to marketing e-cigs.